Sharing files on the Internet can be done smoothly with tools like Vuze. It is a client program for network "Peer-to-peer." It is integrated with a powerful search engine as well as many other functions. Search: searching for a file on a website is now accessible thanks to Vuze. For that, users just have to enter the name of the file they are looking for and to paste it in the search box of the interface. Browsing the Internet is not needed, just click on the desired file to start download. Subscription: if a user shares an interesting file, it is possible to subscribe directly so as to be informed of new shares. The time a new file is available, Vuze is going to report it. This option avoids launching searches repeatedly. Accelerator: download is fast for the simple reason that the software itself is powerful. Users can download several files according to the order of priority which can be customized. For that, users are allowed to give priority to some favorite files. Player: as a plus, an HD video player is also integrated with Vuze. It can play video files in AVI, DivX, QuickTime or another format. 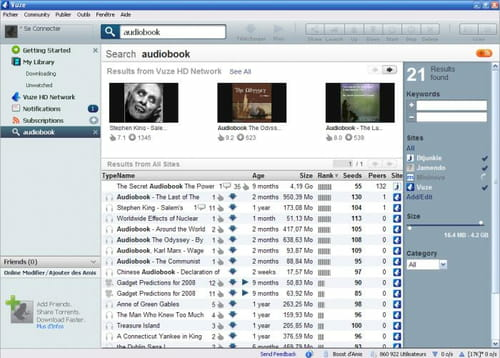 HD Video Player and Search engine integrated. Vuze is very easy to handle. Latest update on May 25, 2016 at 05:00 AM.